Pelage: Black short fur, top of head is brown, face hairless. Habitat: Tropical & montane rain forests, including forest swamps. Social Groups: 4-6 adults. 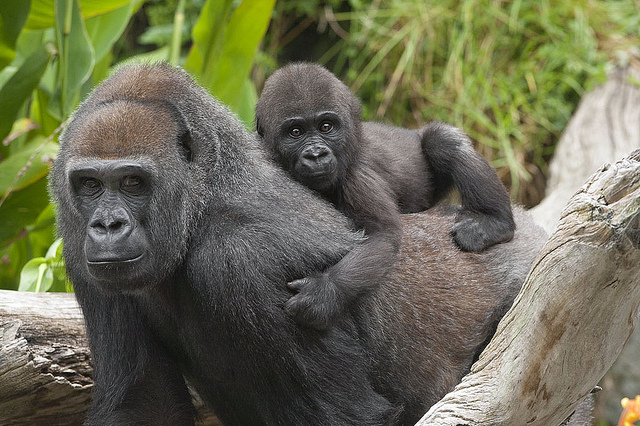 Male silverback dominates. Age to maturity on par with human development. Females only give birth every 3-5 years. Build nests at night. Emerging risk of oil palm agriculture. © 2006-2018 San Diego Zoo Global. Updated 2018. Conservation update 2016. Amended IUCN update 2018.